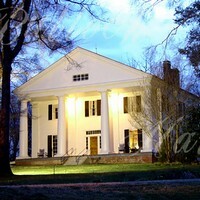 The gracious and elegant Bulloch Hall was built in 1839 by Major James Stephens Bulloch. The impressive Greek Revival structure, a Willis Ball design, has been described as one of the most significant houses in Georgia and one of the South's few examples of true temple-form architecture. The floor plan, typical to the period, features a lofty center entrance hall with an equal number of rooms on each side. The house is beautifully furnished with authentic period furniture and includes a museum room with a history of the family. The grounds include reconstructed slave quarters, a privy, a summer house, wells, gardens and a museum shop.